In 1998, International Needs Ghana played an integral part in a campaign which led to the release of around 2,800 Trokosi girls and the banning of the Trokosi practice in Ghana. Today, International Needs help many of the liberated girls by providing education and vocational training. 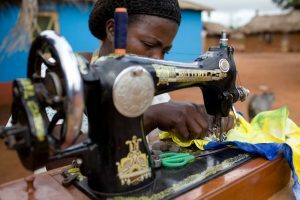 Many girls are unable to return home due to local stigma, therefore use vocational training to find a way of supporting themselves. At the Adidome Vocational Training Centre, the girls can take free training courses to learn new skills to help them make a living. The girls are also taught about human rights issues, including violence against women and about reproductive health. They are also given literacy classes. Forgive works as a dressmaker now. After she was liberated from the shrine, she went to International Needs training school to receive counselling and to learn skills to be able to make her own living. They can learn to sew, bake bread, make soap and beauty products, and much more. The centre also offers medical check-ups counselling and support for the girls who are often badly traumatised by their experiences. When they finish their training and prepare to leave the centre, they are supported with equipment and materials so they can begin their own small business and make a living. Trokosi is a form of shrine slavery practised in the Volta region of Ghana and Togo. Girls are sent into ritual servitude at a shrine and become a Trokosi (Wife of God) as a sacrifice to atone for the sins of family members. The girls are kept in the shrine, many are subject to physical and sexual abuse, forced to work, and may never leave. Many will give birth to children fathered by the priest. Enyonam shows what she had to wear when she was a trokosi. Now a free woman, Enyonam says one of her primary pleasures is being able to dress herself and chose how she does her hair. Those who run away or die are replaced with another girl from the family, as the family, and often the girls themselves believe it is the only way to protect the family from the punishment of the gods. Following the 1998 campaign, the practice is now illegal. Mercy was taken to the shrine as a young girl. At the age of 9 she tried to run away back home but her grandfather tied her up and brought her back. Mercy had 3 children with the priest. In 2018 BBC Africa worked with International Needs Ghana to produce a short documentary following the story of Brigitte, a former Trokosi who was released from a Shrine though International Needs Ghana’s campaign. Watch ‘My Stolen Childhood’ on youtube here. 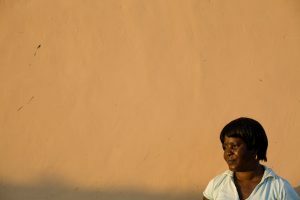 Twenty years after she was freed from this practice, Brigitte Sossou Perenyi goes on a journey to understand what trokosi really is and why her family gave her away. In 1998, International Needs Ghana led a campaign that resulted in the release of over 2,800 women and girls who were kept as slaves in shrines, a practice known as Trokosi. By 2003, over 3,500 girls and women were released. International Needs still support the rehabilitation of women freed from Trokosi and many other young women with vocational training courses and more.